Are you searching for a mid-size sport utility vehicle (SUV) that delivers on all cylinders? 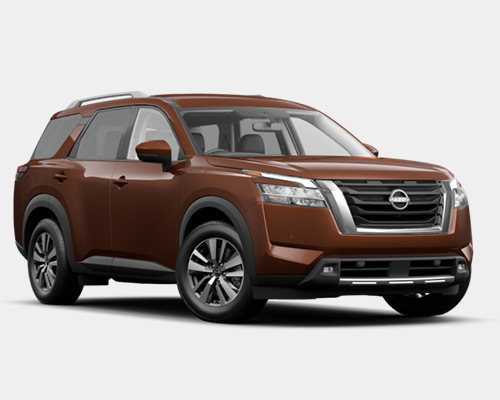 Since the answer is likely yes, then you will want to learn all about the exciting new Pathfinder to buy or lease from Boardman Nissan in Youngstown. 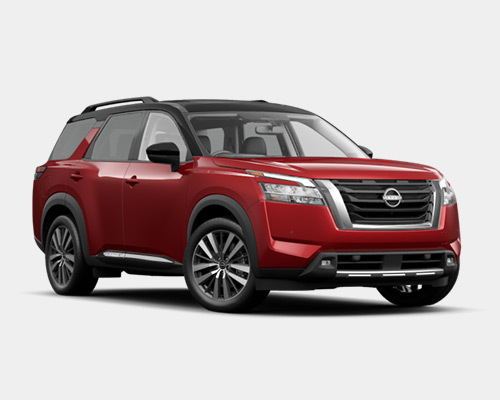 We have no doubts taking a few minutes out of your busy day to look over everything you would seek to know regarding this notable SUV results in visiting our dealership soon for a closer review of it. 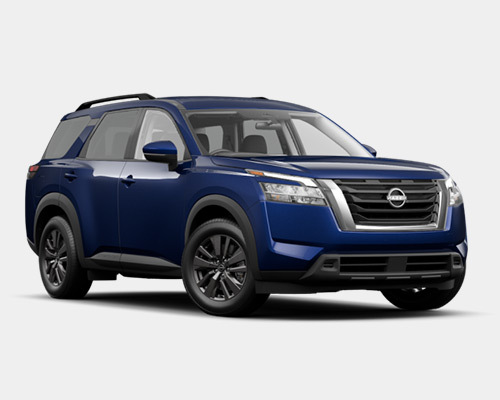 Because of the rugged exterior highlighting curvatures on the lower half, side mirrors matching the body color and including a turn indicator, projector headlights with a signature LED line, and trademark taillights, there is no mistaking your arrival in a Pathfinder. Also adding to the unmistakable appearance are deflectors and spoilers located in strategically chosen spots. Not blending in like other SUVs you come across on your travels becomes second nature when all sides show off unequaled attention to detail. Purchasing or leasing the brand-new Pathfinder at Boardman Nissan enables your family and friends to come along for thrilling escapades near or away from the Youngstown OH area. Up to seven passengers can quickly climb in and access third-row seats utilizing the EZ FLEX Seating System with LATCH AND GLIDE functionality that tilts the second row of seating forward with ease. Sliding over the middle chairs to open up five additional inches of leg room and reclining the last row of chairs also offers extra comfort. Pathfinder possesses the necessary strength, towing abilities, and off-road handling to plan out a wide range of excursions you have been longing to take. You can tow an upper limit of 6,000 pounds (lbs.) via the 3.5-liter (L) Direct Injection Gasoline (DIG) V6 engine that generates 284 horsepower (hp) and 259 pound-feet (lb.-ft.) of torque, as well as maintain steadiness on all sorts of pathways by opting for available Intelligent 4x4 with 4WD lock mode. This SUV’s range of power clearly prepares you for hectic city driving on a daily basis, cross-country journeys, and everything in between. Standing as a more affordable option in the Pathfinder lineup, SV simplifies your routine drives across Youngstown and exploration of newly discovered paths in multiple ways through practical inclusions. Some of the many conveniences awaiting you are a Tri-Zone Automatic Temperature Control System, auto-dimming rearview mirror, Nissan Intelligent Key, Remote Engine Start System, and variable intermittent windshield wipers incorporating flat blades and speed responsiveness. By adding on to SV’s base of handy features, Pathfinder SL further increases your level of panache and comfortable riding. SL provides a cozy interior setting and keeps you on the correct route anytime you start up the engine thanks to additions like a 10-way power driver’s seat with two-way lumbar support, heated steering wheel and seating (two rows), and the Nissan Navigation System. Leading the pack in each aspect, Pathfinder Platinum comes equipped with everything you require to journey wherever you choose and command the roadways. This luxurious SUV without question elevates your regular commutes and weekend getaways, while holding the interest of others, owing to attributes ranging from a Dual Panel Panoramic Moonroof and leather, temperature-controlled front seating to the tow hitch receiver incorporating a seven-pin wiring harness and 20-inch (in.) aluminum-alloy wheels distinctively designed. Lack of storage space when loading up lots of cargo and having to leave things behind will no longer cause you much frustration. Using little effort, seats in the second and third rows of the Nissan Pathfinder fold down to create a level storing area of 79.5 cubic-feet (cu-ft.), and a swing of your foot under the rear bumper expedites putting stuff in by triggering the Motion Activated Liftgate. Moreover, you can pull out of the driveway sooner after you store valuable possessions in the underfloor section, fasten large toys to the roof rails (crossbars offered), and press the nifty ignition button. Owners or lessees of the reinvented Pathfinder from Boardman Nissan reap the benefits of having entertainment, voice-recognition communication functions, and important details right in front of them. Bluetooth, the NissanConnect eight-in. touch-screen monitor, Advanced Drive-Assist Display, and SiriusXM Travel Link (three-year trial complimentary) ensure you remain connected in numerous forms, including hands-free calling, bringing up weather forecasts, operating apps, and even viewing movie times. The ride to your destination becomes equally enjoyable with such an abundance of accessible in-car technology. What you should consider at this point? Dropping by Boardman Nissan to purchase or lease the Nissan Pathfinder trim you prefer brings totally new opportunities for exhilarating excursions in Youngstown and outside city limits due to off-road competencies, class-leading towing, and cabin adaptability.